The Randy Described Eternity font was created from dollar store stamps, which I still use to this day on birthday and holiday cards. The font was originally released in August 2001. In February 2016, I added several more characters to the set, including accent characters. 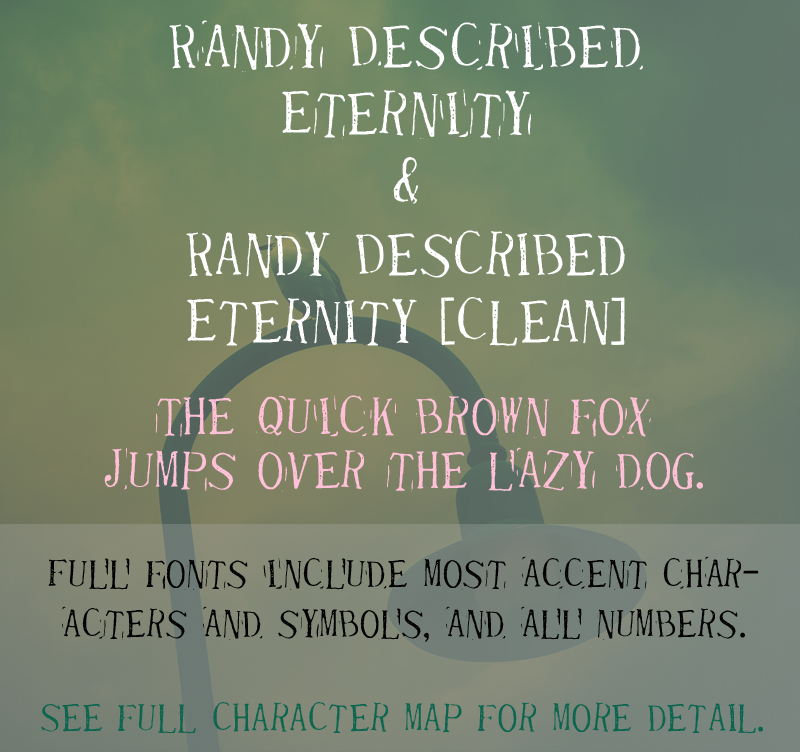 I also created a second font called Randy Described Eternity Clean. It is nearly identical, except I removed the rubber stamp edges from each character and brought the characters a little closer together. It may be a little easier to read. Both fonts are included in the same demo download and purchase. This is a DEMO version of the font. It includes only uppercase and lowercase letters. You can use the demo version for personal use. The full version of the font, which can be purchased very very cheaply at QuickBrownFoxFonts.com, also contains numbers, most puncuation, most accent characters, and many symbols. You can view the full character map at QuickBrownFoxFonts.com. Purchase of the full version entitles you to a full license of the font, with which you can use the font commercially in any project.